Started karate training in 1970 for 6 months of taekwondo while stationed in Hawaii. Started again from 1973 to 1975 at Yuma Arizona MCAS. Shotokan Karate Ranked Brown Belt. Changed to Chinese Goju Karate from 1975 – 1976 while at MCAS Iwakuni Japan and obtained the of Green Belt. During this time I came to Okinawa and studied Shorin Ryu Orthodox Karate-Do under the Ku-Dan (9th Degree) Kise Sensei for 2 months. Changed at Camp Pendleton, Ca to ALO Kempo Karate from 1976 to 1978 ranked Green Belt. Then Isshin Ryu Karate from 1978 to 1979 Ranked Green Belt. Returned to Okinawa Japan from 1979 to 1980 &amp; studied under Hanshi (Grandmaster 10th Degree) Kise, Okinawan Kenshin Kan Karate-Do and Kobudo Federation. Promoted to the rank of Sho Dan. Returned to the States for two years 1980 to 1982, Yuma Arizona and opened my own Dojo for Master Kise, Okinawan Kenshin Kan Karate-Do and Kobudo. Returned to Okinawa Japan from 1982 to 1985. Taught for Master Kise at the Makiminato Dojo. Studied under both Master Kise and Isao Kise at that time. Promoted to the rank of Nidan. Returned to the States Amarillo Texas from 1985 to 1988. Opened my own Dojo at Texas State Technical Institute (TSTI) and taught All Okinawan Shorin Ryu Kenshin Kan Karate and Kobudo. During these three years, I studied with two different taekwondo schools, Harvey’s USA taekwondo and Master Cho’s World Taekwondo Federation (WTF). Moved to San Diego, Ca from 1988 to 1991 and continued to teach for Master Kise. Returned to Okinawa From 1991 to 1993. Was promoted to San Dan my first year. Studied under Master Kise and Isao Sensei. Taught at Camp Foster and Kadena Air Base. Promoted to the Rank of Yon Dan upon my departure. Returned to Camp Pendleton 1993-1996. Opened a dojo at Del Mar, CamPen, CA. Returned to Okinawa in 1996 and taught children class at Camp Courtney and left in 1999. 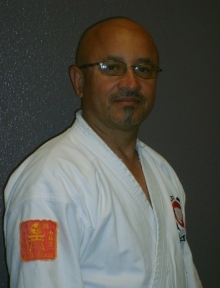 Currently teaching at Arizona Western College, Harvest Preparatory Academy K-8, Yuma Shorin Ryu Karate 1380 S. Avenue B, Studio B, Yuma Az 85364 ext 928-502-0210.